Weekly Shonen Jump’s insane adult-styled parody series is in America. 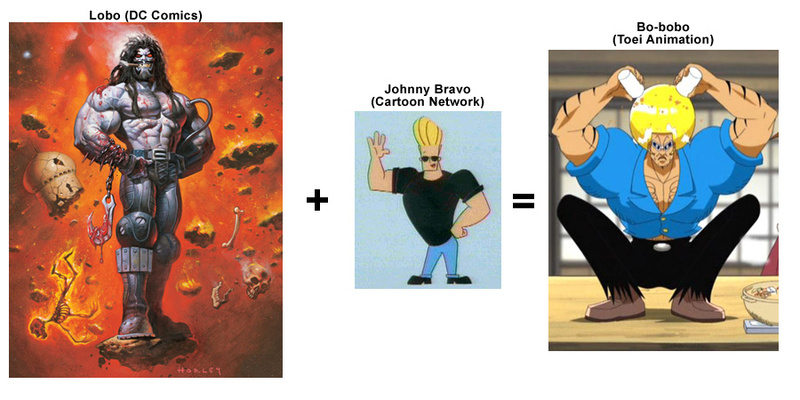 Of course, if you have Cartoon Network then you probably already know what BoBoBo-Bo Bo-BoBo is. OK, who am I kidding? You’re probably still trying to figure it out and aren’t alone. Bo-BoBo takes adult humour, bizarre cultural references, and lots of anime parodies to create a “running gag” show that makes you wonder how long they got away with it (76 episodes). Illumitoon Entertainment has taken up the job of releasing the series “uncut,” according to the packaging, which adds back in the Japanese track and subtitles. But how does Bo-BoBo: Bo-nafide Protector fare from the new company? Notes: Review is based on a Screener copy of the final product. Not well is the unfortunate answer. Illumitoon gathers together several former FUNimation employees, yet something seems to have gone “oops” in the conversion. 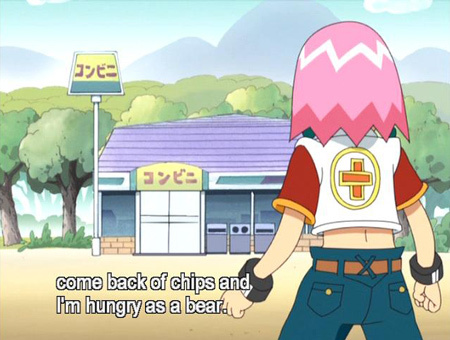 While Bo-BoBo does appear to be uncut, I have not watched the US TV airings or the Japanese DVD’s before, there is a big problem regarding the subtitle track. Bo-BoBo: Bon-nafide Protector’s subtitle track is a closed captions track for the dub. In fact, there’s a very good chance this closed captions track is pulled from the US TV airings because the script gets words and phrases wrong a lot each episode, like “back of chips” instead of “bag of chips.” Bo-bobo’s catch phrase “Snot for you!” will appear as both “Snot for you!” and “Not for you!” in the same episodes. Despite the addition of the Japanese track, it’s useless when your subtitles are simply closed captions for the English dub. Subtitle problems aside, this series is a riot. I only watched the series with the English dub given the lack of an accurate Japanese translation. 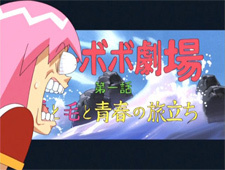 The English dub consists of a good crew of industry regulars attempting to make the most out of a series that is heavily based on Japanese jokes and on-screen text. Phuuz Entertainment, the same studio that also dubs Lupin the 3rd TV, has tried to work together jokes that will cross the language barrier since this series was originally destined for Cartoon Network TV airings. One running gag has the different characters pointing out that they can’t read Japanese or that the narrator’s translation of something doesn’t seem to be accurate. The parody show’s dub pulls off the wacky style needed to keep the series going and I give them props for being able to do it very well within the limits probably placed upon them. 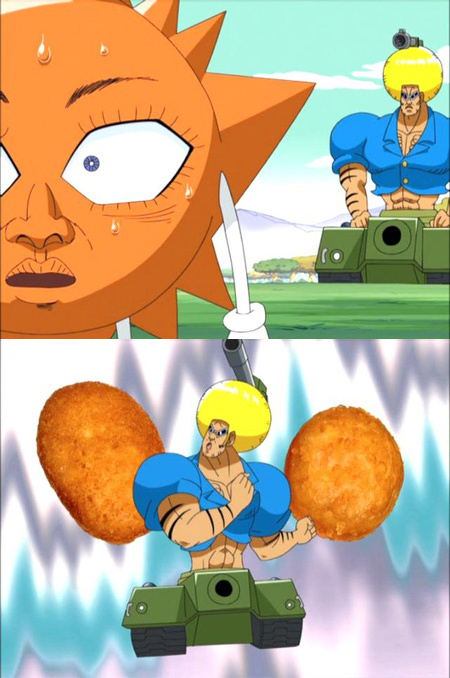 BoBoBo-Bo Bo-BoBo is part everything, in a sense. Bobobo-bo Bo-bobo, the possible love child of Lobo & Johnny Bravo, travels around fighting against Baldy Bald’s chrome dome soldiers. 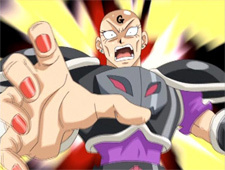 Baldy Bald & Co. attack villages so they can shave off everyone’s hair to make them realize that “Skin is in!” Only Bobobo-bo Bo-bobo’s ‘fro dares to challenge these squares, or should that be rounds, by using his Nose Hair techniques against all those who would dare to cut off someone’s hair. It sounds strange at first, but watching it in motion really makes it work. The list of anime parodies includes Fist of the North Star, Mobile Suit Gundam, Dragon Ball/DBZ, Naruto, Sailor Moon, and an endlessly growing array of others. Each episode also contains a trip to the B.O. Biographical Theater for a wacky backstory to whatever is going on during the episode. Witness the drama, intrigue, possible horror, and always a good laugh look at Bo’s childhood, the origin of a duck that is half undies, and other bizarre tales that need to be told. 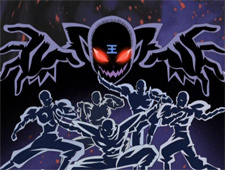 The first four episodes in the series are used to introduce most of the regular characters. 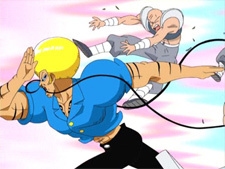 Bo-bobo uses his Fist-of-the-Nose-Hair-style fighting to defeat a gang of Hair Hunt troops from G Block attacking a village. One girl he happens to save from the clippers is the pink-haired cutie Beauty. Shocked by his fighting style, we get our first visit to the theater to watch child Bo wandering around as he listens to what everyone’s hair is saying. Yes, he can hear hair talk. This may seem a tad… odd – until we see part two when we find out his father was a hair follicle. Bo-bobo gets teary-eyed as he remembers his brave father who gave him up so that the father could escape getting punished himself. Yeah, Bo knows… nothing. While the badass seems to be a few bricks short of a wall, his skills are unmatched as he takes on each shiny-domed challenger who comes his way. After finishing off the G men, Bo-bobo takes the battle to Commander Hoggin for a showdown. 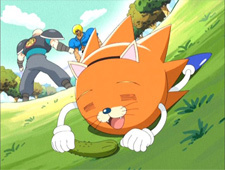 The second episode introduces Don Patch, an orange sun-looking character with a huge ego, as he challenges Bo-bobo to a fight to the wig out. Don and his group, the Hajikelists, have been terrorized by the Wigbro gang and mistake our afro hero as one of its members. The battle wages over things like who has the saddest Christmas story to wig out to and Bo-bobo pulling out a super sentai-style transformation only to play with a multitap game against a pig. In the meantime, Teroshi of the Wigbros kidnaps Beauty. Bo-bobo eventually defeats Don Patch in the wig out contest and then goes off to save Beauty from the gang of male model Wigbros. Don Patch tags along for the adventure and the two team up to defeat the Wigbro Commander, Mytell of H Block. Should I mention the rugby dating, the mystery kid watching Beauty, and Bo-bobo becoming a carrot AND a cabbage? Nah… But, there is a swimsuit scene. Bo knows swimsuits. Episode three spots Beauty pulling Bo-bobo through the forest as he’s contemplating how a burger feels by dressing as a hamburger. If that doesn’t explain everything you need to know about life, the universe, and everything… nothing will. 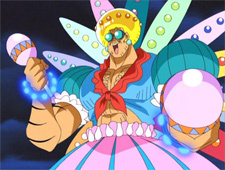 The pair pull into a village celebrating with a costume festival when Bo-bobo starts to make fun of them. Things quickly turn sour and Bo-bobo gets challenged by the Dynamite gang to a dueling game of risks. Whoever out-risks the other wins and Bo-bobo is determined to grab the gold by diving into the stockmarket. Yet this is meaningless when Beauty wakes up in the forest to realize it’s all a bad dream. She starts to look for Bo-bobo when she notices a duck peeking around from behind a tree. It’s the Hair Hunt’s Killerino with duck undies on his head and he has captured the oblivious Beauty with his daring disguise. Bo-bobo charges in wearing a schoolgirl outfit to save the day, reveal the past of some underwear, and maybe figure out how a hamburger feels. Our final episode opens with Don Patch finding the Beauty and her afro beast by mailing himself to Bo-bobo. Patch’s followers are glad to see that he’s all right, but they’re confused as to why he has been avoiding them. It seems that Don Patch forgot that he still needs to graduate from Wiggins School. Patch runs off to school and sits down when he hears his name called. In the schoolyard is an army of bicycles manned… err, beared by Teddy Bears and led by Bo-bobo himself. Don forgot his lunch box and Bo-bobo has brought it for him. Oh, the endless curriculum of school parodies. 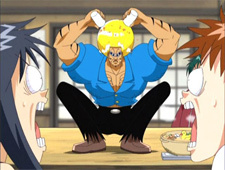 The second half of the episode follows Don Patch having joined Beauty and Bo-bobo. Walking through a field, Bo-bobo Tank aims and fires at Don Patch as he pushes a baby stroller with a ventriloquism dummy inside. The group set up camp and fetch dinner only to get Codavon of the Hair Hunt River Block instead of a big fish. With the ability to read minds, Codavon takes on Don Patch and Bo-bobo in yet another twisted battle for the show. Bo-BoBo: Bon-nafide Protector has some good and bad things going for it. The subtitle track issue is a very bad problem and one reason I would probably skip until it is fixed. Along with needing an accurate subtitle script, the show could also use a signs-only subtitle track for the countless moments where Japanese text is on-screen. Character names, special moves, haikus, and much more need a translation to help further some of the jokes. And while the English dub attempts to cover as much as it can, it shouldn’t be forced to be the only way to understand everything going on in the show. The video has some minor artifacting, but otherwise no issues. The $20 MSRP would make this a great buy if the problems were not there because the show is a riot. But currently I would only consider grabbing it for about $8 in its present state. However, fans of the Japanese series should try to contact Illumitoon in the hope of getting these issues fixed before the next volume hits the market if the series is to find buyers beyond those who have watched it on Cartoon Network. Update: Illumitoon Entertainment is offering a trade-in program for this volume to correct the subtitle error. Offer expires 5/30/2007.